Located in the beautiful Shenandoah Valley, Bridgewater Retirement Community provides a vibrant, friendly and safe environment to age gracefully. Recognizing a need to continue to improve their facilities as well as create a second memory support house, Bridgewater HealthCare Foundation retained The Curtis Group to conduct a planning study prior to launching a campaign. Through this extensive study, we uncovered a history of successful fundraising campaigns, a close-knit community of donors, and strong leadership. We determined that the capacity was there, so long as they committed to fundraising best practices. Here’s how we brought Bridgewater Retirement’s vision to fruition. So that our firm could support all aspects of their fundraising, we recommended a comprehensive campaign to raise the capital, grow their annual fundraising program and build their endowment. Our initial fundraising training and ongoing coaching sessions strengthened a leadership team already excited about and capable of raising the support. Even since the campaign’s completion, the board recognizes their need for ongoing training, inviting us to speak at a board retreat. The volunteer leaders as well as the president and vice president of development are committed to fundraising and its processes. Together, we regularly met as a committee to identify prospects and strategies. We also prepared staff and volunteers for cultivation and solicitation calls to maximize donor potential. All the while, we worked with the staff to enhance their annual appeals, codify their annual goals and streamline their events. The team had several successful, established fundraising processes and engagement strategies that we could incorporate into the campaign, while also modifying and eliminating others to create a stronger major-gift fundraising program. Carrie Budd appreciated the opportunity to incorporate a big-picture assessment of their overall foundation operations into the campaign. At the culmination of our work together, Bridgewater Retirement Community had raised $300,000 over their $3.2 million goal. AND, they had grown their annual fund and created a legacy for the future by raising support for their Resident Care Endowment Fund, which supports residents who no longer have financial resources. 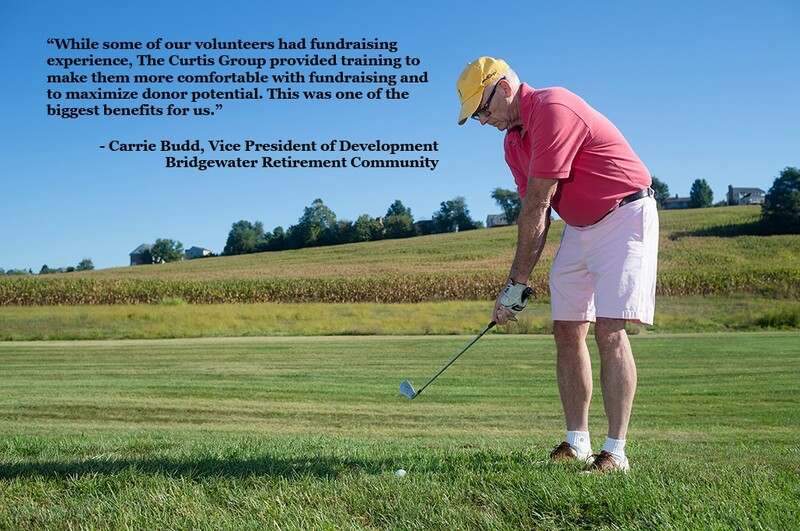 The Building Connections Campaign was transformational on multiple levels for the Bridgewater Retirement Community and their residents. For more stories and case studies, visit click here.